The history of Merano itself and its surroundings is a long, involved story and features the migration of people, the movement of soldiers and the trade of goods. Once the home of the ancient Retic tribes, then an important transit centre, later a fortified Medieval town, Merano was chosen as capital of the then Tyrol region from the thirteenth century on and also administrative centre of the Burgraviate area stretching from Tel at the opening of the Venosta valley to Gargazzone in the Adige valley. The town retained its title as capital even when the new Counts of Tyrol moved their administration offices and the civic mint to Innsbruck in the fifteenth century but, then no longer politically nor economically important, Merano then later became simply a popular residential centre for the Tyrolean nobility who chose to build their sumptuous residences here in the sixteenth century. 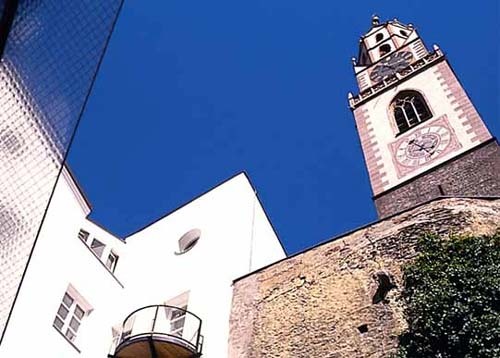 During the seventeenth and eighteenth centuries many refugees from the Grigioni area arrived in Merano to escape from religious persecution in their homeland. 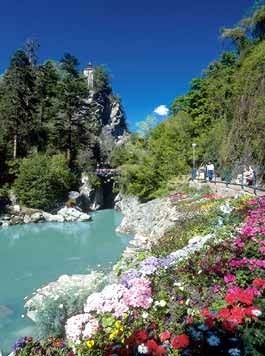 The nineteenth century marked the rebirth of the town when some of the local doctors together with an attentive town administration proposed Merano as a health spa and it soon became one of the most popular resorts in Central Europe. 324 metres above sea level, protected by the mountains from the cold north, the town has a delightfully mild climate and, soon, Hapsburg, Prussian, English, French and Russian nobility and aristocracy graced the resort with their presence. Luxurious hotels and elegant public buildings were to be seen everywhere and it seemed that nothing could go wrong until the First World War broke out in 1914 and everything came to a temporary halt. 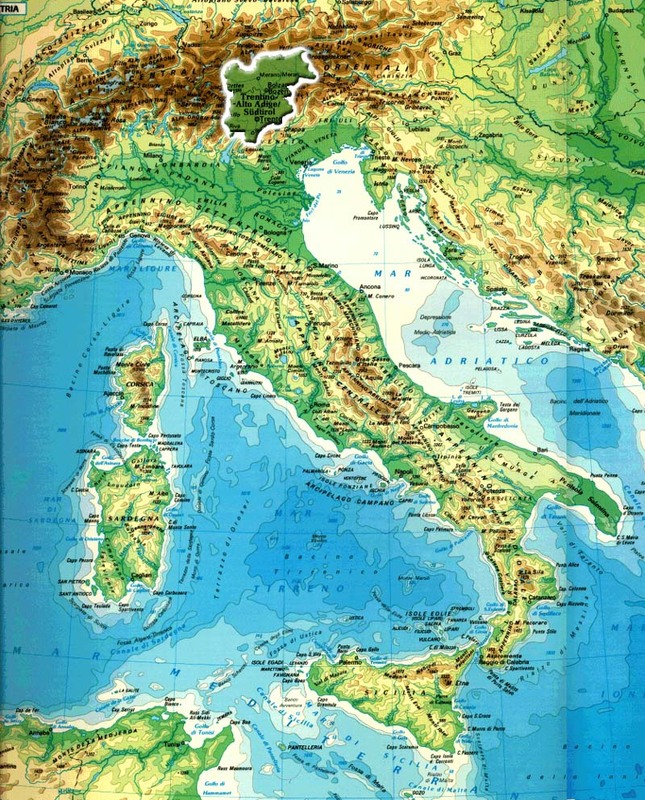 It was necessary to re-promote the town between the two wars but the discovery of the health-giving radio-active waters at Monte San Vigilio helped until,once again, development was interrupted by the start of the Second World War. 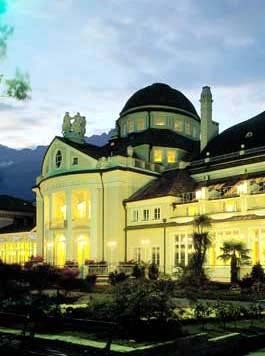 Merano has slowly regained its name as a health spa and tourist centre in recent years. 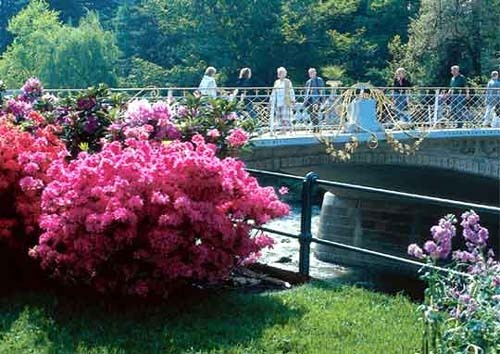 Its elegant buildings and beautiful gardens and parks help make the town truly unique in the whole Alpine region. The Civic Theatre, dedicated to the famous composer Puccini, was designed in 1900 by Martin Düfler, the most imaginative exponent of German Liberty-style architecture and is an attractive construction with classical elements and floral decorations. The Post Office Bridgewith its wonderfully ornate Liberty-style golden railings was built in 1906 and recently tastefully restored in 1993. The Kurhaus, a truly magnificent building, designed by Vienna architect Friedrich Ohmann in 1914, is, without doubt, the loveliest example of Liberty-style architecture in the entire Alpine region. The great hall holds over 1,000 people and is equipped to host international congresses, conferences, exhibitions and concerts.. The adjacent elegant Pavillon des Fleurs, built in 1874, has seating for 300.